Acer palmatum ‘Bloodgood’ is an upright Japanese maple that is known for it’s deep red, almost purple color. Bloodgood is a wildly popular tree that tends to hold it’s red color throughout the growing season. The origin of Bloodgood isn’t exactly known, but it has been in production in the United States since before 1940. 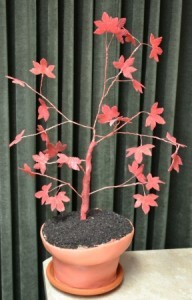 Bloodgood is one of the few Japanese maples that is commonly propagated from a rooted cutting, whereas most Japanese maples are grafted onto a hardy root stock. However, I’d still have to say that many, if not the majority, of bloodgood are still grafted since rooting them is not easy. Only a few propagators in the country really know how to do so with predictable success. At this time I only have two photos of Bloodgood and admittedly, neither are very good pictures. They were taken late in the growing season. These trees had been in winter storage then planted out in the field in April, and as you can see from these photos the leaves are a little stressed. I will add better photos to this page in spring 2012. I’ve learn some good stuff here. Certainly price bookmarking for revisiting. I surprise how much attempt you put to create this sort of wonderful informative web site. I bought a “Bloodgood” Japanese Maple last spring (2015) for a certain spot at my front entryway and when my husband was digging the hole we discovered the the area was clay and not at all suitable because of poor drainage. We were not sure what to do, since I did not have an alternative spot for it and we let it set in the pot too long without water and it got terribly stressed. When we realized what we had done, we quickly chose a spot and planted it with good manure and soil and even though it lost most leaves, it did put off some new leaves and we thought it would be fine this spring. So far, it has only put out a few leaves down low just above where the first fork to the upward branches are. No leaves at all on any of the higher branches. It is about 5′ tall. Should we let it alone or cut it back to where the new leaves are? Help! Waiting a bit longer is usually a good idea, but you check those up stems. If they are dead, might as well prune. This is how you test to see if a plant, or a branch on a plant has died. Just scratch the bark of your plants with your finger nail. If the tissue below the bark is green and firm your plants are fine. If the tissue is brown and mushy that part of the plant is dead. 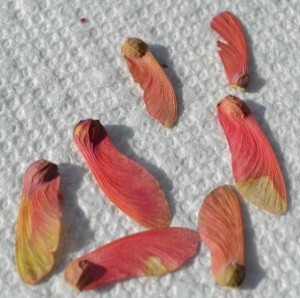 My maple tree was bright red last fall. This fall the leaves are dark burgudy or even black in color. Lots os samsara also. Is my tree dying? Probably not, let the leaves drop and see what spring brings. Nothing you can really do.